And so…another week of my anti-Sugar Rush continues. Well, not that I’m anti-sugar, but like I explained last week, I am changing it up this year and doing two weeks of savory, delectable appetizer “treats” with a highlighted recipe from years past of Sugar Rush. I feel a little redundant swooning over each of the recipes I’ve posted with Sugar Rush Reinvented, but I’m telling you, I hit on some wondrous recipes this go-round. 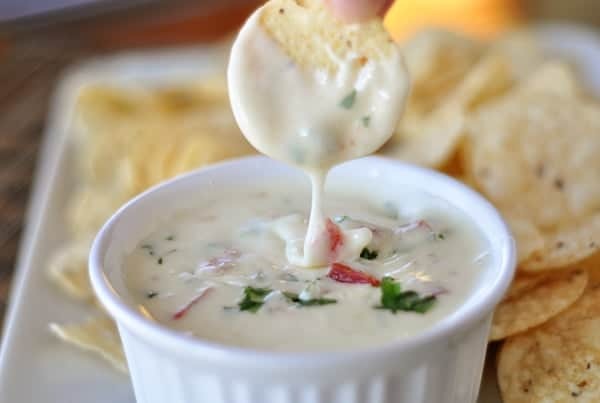 Even though I stated the pinwheels were my favorite, I had to sidestep that claim when the pizza bites knocked my socks off, and now…if the quantity of queso blanco dip I devoured (rephrase: me and the baby devoured) is any indication, this might be my actual favorite. Until tomorrow, that is. So creamy. So smooth and perfectly melted. So flavorful. I’ve been dying for a good white cheese dip like the kind I crave and order at any and all Mexican restaurants and this did not disappoint in the least. I really feel that if you and I are able to remain friends, you need to add this dip to your repertoire immediately. Not only is it extremely simple to prepare, the absolute delicious creaminess beholden in the pot of melted cheese is enough to make anyone swoon. Heat the oil in a medium saucepan over medium-high heat. Add the onion and jalapeño to the pan and cook, stirring occasionally, until tender, about 5 minutes. Add both of the shredded cheeses and 1/4 cup of the milk. Whisk or stir until completely melted. Mix in the tomato and cilantro, and add additional milk gradually as necessary to achieve desired consistency (I added about 1/2 cup total). Transfer to a warmed serving bowl and serve immediately. White American cheese can be found at the deli counter in most grocery stores. I could only find it pre-sliced so instead of shredding it as stated in the recipe, I simply cut it into thin strips. Also, this dip reheats beautifully on low in the microwave or on the stovetop. Not that there will be any left...but if there is, now you know how to reheat. Super delish! Love that it uses real cheese – not extra processed, fake blocks that almost never expire. And, adore how yummy, creamy and easy it is. This will definitely scratch your queso itch! Help! I bought the wrong cheese and didn’t notice until I had melted in with the other ingredients! White cheddar instead of white American! Now what? Any suggestions? Help! My husband picked up the wrong cheese. He brought home white cheddar instead of white American. I did not notice and melted it! Now I have a Gobbie mass any suggestions for how to use it? Honestly, I’m not sure what to tell you, Amy! It may not be salvageable. Sorry! A friend recommended your blog to me several months ago and I thought it was time to let you know how much I enjoy cooking your recipes for family and friends. I made this queso this week for an end of school year get together for my daughter’s classmates. It was easy to make and tasty to eat! Thank you for sharing your love of cooking ! What’s with all the pop-ups on your site now? Making this. Can’t wait. My teens are going to be in heaven! Thanks! When I first tasted this right after making it, it had absolutely no flavor. Just tasted like melted cheese. Then I let it sit on the stove for an hour or so (heat off) while I ran out to do errands. When I came back and tasted it, it was much better. The onion and cilantro had had time to bloom a little. So I would suggest making this ahead of time. I also added a sprinkling of ground chiles just for a little smoky undertone. I added a couple pinches of salt also. Made this tonight for my husband’s football draft party and it was delicious! I added half a poblano pepper in with the onion and jalapeño to add a little depth and smokiness without anymore heat. So yummy! Quick question…Could I make this up a few days in advance and then just heat on low prior to serving? Yes, I’ve done that before (reheated the leftovers that way) and it works great as long as it doesn’t heat too high while warming up. Mel is there anyway I can add ground beef to this ? Sure – I’d probably cook the ground beef and add it in at the very end. Have been eyeing this recipe for a long time and so I decided to try it for our Super Bowl party yesterday. I couldn’t find American Cheese at my grocery store (they only have non-processed cheeses) and so I used monterrey jack for the entire recipe. TOTAL DISASTER! The consistency was lumpy, grainy and the flavor was off. So sad! I was so excited to try this. I made this tonight for Super Bowl and it just was okay. I used boars head cheese and it was spendy. In the end the dip was bland and way too salty. Too bad, this has been a first one of your recipes we weren’t crazy about. Need to add tomatoes to the ingredients. This dip looks so good. I have a small 3 pot crockpot that I use for summer parties and this dip is going in one of them for sure!! Lauren – as long as your slow cooker can maintain a low temp without scorching, you should definitely be able to keep this warm in it. Would I be able to transfer it into a crockpot to keep in warm and at the right consistancy? Shoot Mel, another winner and another 5 pounds! Can’t you disappoint me just once? J/K have you had that baby? Wishing you the best of luck in your delivery! This is a fantastic recipe! It is delicious as is but now that I have tried it a couple times I have altered it a bit. I add a little red bell pepper and garlic to the onion when I saute. I also use more cilantro. The white American can be found at the deli counter at any grocery…just have them give you a block instead of slicing for sandwiches. Ali – I’m so sorry the cheese you bought didn’t work out. I’ve never heard of Flagship cheese, to be honest. I’m surprised it was so hard to find the American cheese but I guess each store must differ in what they carry. Do you have a Walmart close? Every Super Walmart I’ve been to carries it in their deli, in case that helps. I used the Flagship cheese and it was a disaster. It didn’t combine with the ingredients and was faaaar too rich to go with the monterey. It separated and was a milky gooey mess. I had a lot of trouble finding the White American cheese… I ended up with some fancy Flagship cheese that was a bit pricey. Do you know of any grocery stores that usually carry more variety? Sofaia – I’m kind of kicking myself for not thinking of using my fondue pot for this! I’ve been wondering how to keep it warm (because it really does not fare well once it cools) and never thought to pull mine out. If it were me, I’d make it according to the recipe in a saucepan on the stove and then scrape it into your fondue pot to stay warm (keeping the temperature on low). Great idea! This sounds absolutely delish! Yummy goodness, just how I love it! I am leaning towards christening my never-been-used fondue pot using this amazing recipe. Question- one) would you recommend it?- and two) how would I go about it? So delicious! I used white American and a pizza mix of mozzarella, provolone, and cheddar cheese because that’s what I had on hand. I also used a can of Rotel tomatoes and green chilis along with a fresh tomato, 1T of jarred jalapeño juice, and an extra tablespoon of cilantro. Mmmmmm! It was beautiful creamy with just enough heat. We had some with chips and some with dinner, drizzled over taco meat, lettuce, avocado, fresh tomatoes, sour cream, and topped over more tortilla chips 🙂 thanks yet again for sharing! I thought this dip looked great (and still do), although when I made it, the cheese just melted and lumped together, with the milk in the bottom of the pan. I was so disappointed! Susannah – it’s pretty flexible, you can use yellow or red. What kind of onion? Thanks! Made this for a Christmas Eve appitizer at my parents’ house…. everyone LOVED it! I had to use quite a bit of milk (er, half-n-half) to make it thin enough to dip. It was not too spicy so it was great for a crowd. Thank you! The flavor of this is incredible! I must’ve cooked my cheese too long, though, or not added enough milk because it was way too thick & only dippable for about a minute after being heated/re-heated. Still eating it & loving it! Will try again – tasted yummy!! Moral of the story: If you’re gonna be dumb, you gotta be tough. Buy a box of the tightly fitted rubber gloves. Great for chopping jalepenos, even making hamburger patties. Peel off and toss. You poor thing. I know your pain, but you do take the cake for ” unbelievable”! I learned the hard way too, so I feel your pain. It’s also great with spinach in it. 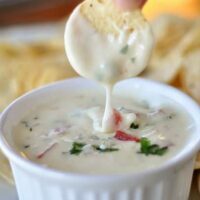 I’ve been making a similar queso for years, but without the sauteeing and I only use white American cheese. I add about half a block of frozen spinach, and it is fantastic! Finally, a cheese dip that rivals the restaurant style. I tried it last night and it was divine!! Thank you, thank you, thank you!!! We love queso dip in this house. We always have an appetizer table at our rockin’ New Year’s Eve party, I think I’m just going to make your entire Sugar Rush Reinvented series. I love that you always do the dirty work for me! This looks AMAZING! So excited to try it! I AM SO EXCITED ABOUT THIS!! Seriously I can’t wait to try this tomorrow!!!! Thank U!! I could do a lot of damage with a dish of this dip in front of me…yum! Trying this on Sunday! Can’t wait! Sounds rich and delicious! I am in charge of chips and dip at our family Christmas party this weekend and I was looking for a new recipe…I have found it!! Yummy!! I can’t wait to try this either! We’re all cheese addicts at our house so it’s sure to be a hit! I can’t wait to try this!!! Our family loves queso, but other recipes I’ve tried didn’t work. I’ve been hoping that you would post one….Thank you!!! I am loving the Sugar Rush reinvented series this year! Definitely nice to see appetizers and not cookies! This is on the must-try-this-week! I cannot wait. I am loving all your posts. Appetizers are one of my favorite items to serve and adding all these new recipes is so exciting for me 🙂 thank you! 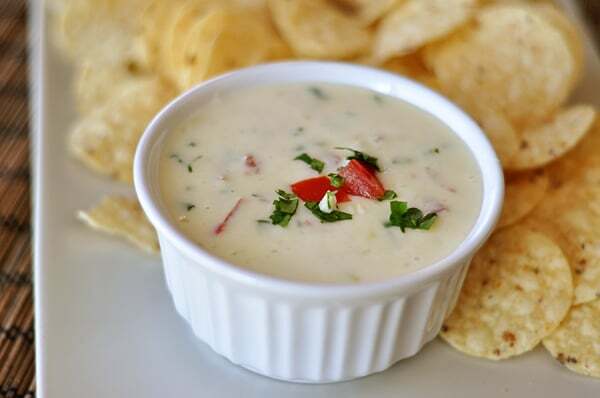 This is the best queso recipe ever! I’ve been making it for at least a year and it is one of our favorite snacks of all time! I like this and may make it for our New Year’s Day party. I’ve made this and it is TO DIE FOR!